In May 2016, CollegeWeekLive, a unique virtual engagement platform where students and colleges meet online, and the National Honor Society (NHS) collaborated on a successful pilot fair, connecting NHS students and higher education admissions professionals through video presentations and online chats. The pilot event saw strong results; more than 1,500 NHS students and 21 colleges and universities participated. Based on the high level of student engagement and depth of the conversations seen in the pilot fair, the need for an additional event was clear. The second National Honor Society Virtual College Fair is scheduled for 2PM–10PM EDT on October 20, 2016. The event will bring schools and prospective students together during the busy fall recruitment season. Throughout the National Honor Society Virtual College Fair, schools will be available to provide information and advice on everything from degree programs to dorm rooms. 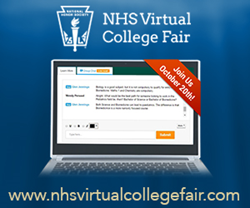 The National Honor Society Virtual College Fair is a free event for NHS students, and attendees can participate in the fair from desktop, laptop, and mobile devices. For more information about exhibiting at the National Honor Society Virtual College Fair, please contact colleges(at)collegeweeklive(dot)com or 800-828-8222.